Recently I wrote a newspaper article about a new Facebook group in Cambridge Bay. You may have heard of the Helping Our Northern Neighbours group that coordinates southerners who want to send boxed of food up to needy families in Nunavut. Well, Cambridge Bay has started up its own group called Cambirdge Bay Nunavut Helping The Less Fortunate for local residents to donate food and clothes to needy families in town. One of the many benefits of this is that donations can include perishable foods, and we don't have to pay the expensive shipping costs! I think it really reflects the generous spirit of Cambridge Bay folks, who always seem to be willing to share, even when they don't have much themselves. You can read the Nunatsiaq News article here. 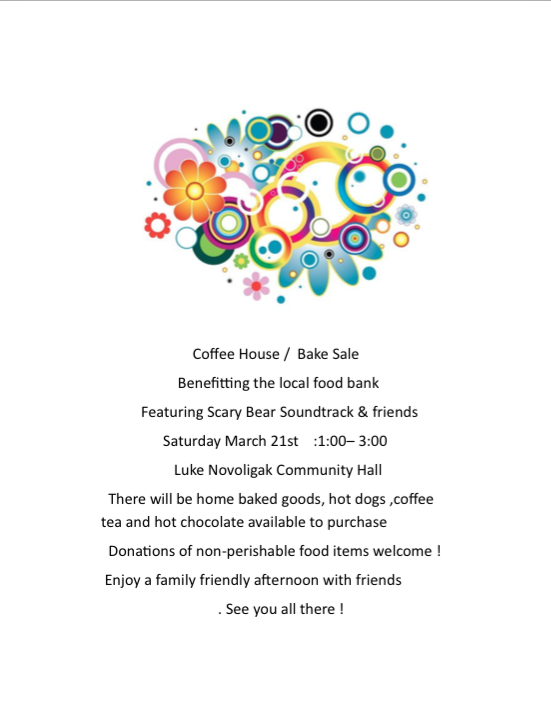 Details for next month's Food Bank Fundraiser can be found here.